For more on the transitional method, click HERE. 1. Socialist Alliance stresses the need for a “so-called transitional method”. 2. Socialist Alliance places a strong emphasis on the “centrality of electoral work”. 3. Socialist Alliance argues against the “classic Marxist position that a mass insurrection is necessary to overthrow capitalism”. 4. Socialist Alliance’s focus is “not on relating to the radical minorities that do want to take a stand or fight back but on more conservative forces in campaign groups and the like”. We could have talked about all these and other differences (feminism and the importance of work around climate change). The truth is that the Socialist Alternative leadership didn’t want to. Originally they proposed all-in membership meetings to discuss three issues on which we clearly differed, namely, electoral work, feminism and work around climate change. This was a good suggestion but when we approached their Sydney leadership for just such a discussion on our election campaign we were told bluntly that they were not interested. That was as close as we got. Socialist Alliance’s political line and concrete work on any question is based on our mass action strategy. There are two criteria here. First, we attempt to address the real problems facing ordinary people. Second, we try to help develop campaigns that mobilise the largest possible number of people, as only this approach can win against the capitalist neoliberal juggernaut. In a recent Facebook exchange, Socialist Alternative leader Corey Oakley said that he didn’t know anyone who was against mass action. But this claim is contradicted by his organisation’s actual practice. 1. In the pre-election period Rudd’s announcement of his PNG gulag plan for asylum seekers galvanised the refugee movement. But in Melbourne, rather than try to chart a path forward in collaboration with other activists to strengthen the Refugee Action Collective, the central activist organisation, we saw Socialist Alternative try to sideline RAC and undemocratically call actions over its head. This course of action was all the more reprehensible as the regular weekly RAC meetings began to attract a lot more interested people. Furthermore, a key slogan of Socialist Alternative at these refugee protests was the call to burn down the detention centres. If desperate refugees are driven to riot and set fire to their tropical prisons, we will defend them and sheet the blame back to the government’s cruel and inhuman policies. However, this is completely different to refugee activists advocating it. This slogan is just ultraleft rhetoric that gets in the way of trying to reach out to broader layers of people. 2. The October 12 abortion rights action in Melbourne was marred by egg throwing and placard burning at a clash with anti-abortion protesters that Socialist Alternative engineered. These actions will make it more difficult to build future pro-choice actions. They will make it more difficult for progressive forces to defend our right to free speech. The “radical minority” line is dead wrong and socialists should reject it. Socialist Alliance does not have a separate approach to the “radical minority”. When we talk to radicalising elements (i.e., those people coming to an awareness that the overall system is the problem and needs changing) we try to convince them of the correctness of what we are doing, especially of the need for a mass action approach. Does Socialist Alliance orient to “more conservative forces”? No. On any question we try to build the biggest, broadest, most effective campaigns because this approach has the best chance of actually winning our demands. This means working with diverse forces — some more radical, some less so. And in the course of an actual struggle many people may well come to more radical conclusions, even socialist ones. Socialist Alternative disagrees with our transitional method. It claims that this leads to a “watering down of socialist politics” and means we can’t “attract and educate” radicalising workers and students. But socialists need a transitional approach. It is really quite a simple idea. We have to reach out to people by relating to their immediate concerns and problems and from there try to lead them towards an understanding that the whole system needs to be radically changed. In other words, we need to find the political bridges that enable people to move from their current consciousness to the understanding that it is necessary to create a new kind of society. Our socialist program as a whole is a combination of three types of demands. There are immediate demands (e.g., decent pay and conditions, stop the closure of the local hospital, stop the sell-off of public housing, raise the age pension) and democratic demands (e.g., marriage equality now, US and Australian troops get out of Afghanistan, defend the right to strike). Then there are transitional demands proper. These can appear reasonable but have an anti-capitalist dynamic that points towards a rational (i.e., socialist) society. These demands may be won under capitalism, but only in particular circumstances and by way of exception. For instance, the call for a sliding scale of wages (i.e., regular automatic wage increases to compensate workers for inflation) is a transitional demand. It is obviously anathema to capitalism as it removes a key wage-cutting mechanism. But this demand was actually won in Italy in the 1970s. The battle then shifted to the frequency of increases and who controlled the cost-of-living index (the government or the unions). Nationalisation of particular sectors of the economy is also a transitional demand and one which Socialist Alliance has sought to use in various forms. It should be noted that no particular type of demand is inherently superior to another in its mobilising power. Which demands are most appropriate depends on the situation. For example, the whole movement against the Vietnam War in the 1960s and ’70s was organised around the democratic demand of self-determination for the Vietnamese people (“US out now”). Socialists have no alternative other than to use this method, and at all times. We can’t simply lecture people about socialism in the abstract. And if we don’t attempt to build political bridges between the here and now and the socialist goal, it will remain just pie in the sky. Electoral work is a key means by which we advance our transitional program. Building campaigns on the ground and contesting elections are complementary. Running in elections gives us an opportunity and a platform to popularise our policies and tie them together in a broad theme (“people before profit”, “community need not developer greed”). 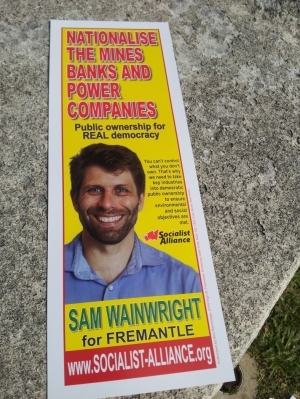 Socialist Alliance’s recent federal election campaign was built around the slogans of “Take back the wealth. Nationalise the banks and the mining and energy sector” — in order to deal with climate change and pressing social problems. In what way does this represent a “watering down of socialist politics”? Why does this mean we can’t “attract and educate” radicalising elements? Socialist Alliance’s whole strategy is based on trying to work with whoever is willing to build the broadest campaigns against neoliberal austerity, war, injustice and oppression. Only out of this process will it be possible to build a big socialist party of struggle that can start to realistically pose a way out of the madness of capitalism. Socialist Alternative has a very different approach. Socialist Alternative’s fundamental strategy is to build its organisation by a relentless attention to recruitment. For this task you don’t need a transitional method because the focus is on attracting “radical minorities” by stunts and ultraleft posturing and asking just about everyone in sight to join. Likewise, Socialist Alternative doesn’t run in elections because to make any impact in this arena you have to descend from the realm of general socialist propaganda and formulate a more concrete and convincing message that can actually strike a chord with people’s consciousness. Finally, we come to the charge that Socialist Alliance rejects the “classic Marxist position that a mass insurrection is necessary to overthrow capitalism”. How will fundamental social change come about? There is no map or blueprint, but long experience shows that we will get nothing unless we fight for it. The involvement of the majority of people will ensure that real change can be achieved and defended. Even if popular forces committed to fundamental change win an electoral victory, we will have to mobilise in the streets, workplaces, schools, campuses and neighbourhoods to defend any progressive moves made against the power of the corporate rich. Today, what more do we need to say? If the situation changes we can say more (e.g., if ultrarightist street violence develops we would call for big counter-mobilisations, popular self-defence groups, and so on). Talking about “mass insurrection” wrongfoots us on so many levels. It will come across to ordinary people — and just about any serious radical — as simply off the planet. Is this really the line of division we need right now — for or against “mass insurrection”? Surely the key task for socialists today is to find the most effective ways to mobilise the greatest possible popular force against neoliberal austerity and the scapegoating policies that go with it. That’s what Socialist Alliance is attempting to do all the time, albeit with our modest forces. The “mass insurrection” line puts us in a bad position to resist state attacks. The state can more easily picture us as conspirators plotting an armed revolt, not caring about winning majority democratic support, and so on. If, in a given country, the ruling capitalist class establishes an outright dictatorship that allows no meaningful legal political activity and crushes all dissent then the popular forces may be forced to prepare an armed uprising. This is what happened, for example, in Iran in 1979, when millions of people rose up and overthrew the brutal US-backed regime of Shah Reza Pahlavi. But this is not the situation we face in the developed capitalist countries today. We have no illusions in the peaceful nature of the capitalist ruling class or in its commitment to democracy, but we should orient to what is in front of us. There are many possible variants of development of the political situation. What if a left party or alliance were to win an electoral majority on a radical program? As it attempted to implement this program it would face some sort of “pro-slavery rebellion” by the ruling class and its supporters. The popular government would have to mobilise its supporters to crush the reactionaries. The capitalists would be the ones trying to carry out an insurrection and the people would have to defeat it! Is this an impossible scenario? Who is to say it can’t happen in an imperialist country at some time in the future. Karl Marx certainly thought it possible in England in the second half of the 1800s. Here is Frederick Engels in his 1886 preface to the English edition of volume 1 of Capital. Free Trade has exhausted its resources; even Manchester doubts this its quondam economic gospel. Foreign industry, rapidly developing, stares English production in the face everywhere, not only in protected, but also in neutral markets, and even on this side of the Channel. While the productive power increases in a geometric, the extension of markets proceeds at best in an arithmetic ratio. The decennial cycle of stagnation, prosperity, overproduction and crisis, ever recurrent from 1825 to 1867, seems indeed to have run its course; but only to land us in the slough of despond of a permanent and chronic depression. The sighed for period of prosperity will not come; as often as we seem to perceive its heralding symptoms, so often do they again vanish into air. Meanwhile, each succeeding winter brings up afresh the great question, “what to do with the unemployed"; but while the number of the unemployed keeps swelling from year to year, there is nobody to answer that question; and we can almost calculate the moment when the unemployed losing patience will take their own fate into their own hands. Surely, at such a moment, the voice ought to be heard of a man whose whole theory is the result of a lifelong study of the economic history and condition of England, and whom that study led to the conclusion that, at least in Europe, England is the only country where the inevitable social revolution might be effected entirely by peaceful and legal means. He certainly never forgot to add that he hardly expected the English ruling classes to submit, without a “pro-slavery rebellion,” to this peaceful and legal revolution. Prosecutor: So your party looks forward to an inevitable civil war brought about by the difference between your views and those of the capitalists? Cannon: If you will permit me, I would like to say we don’t look forward to it in the sense of wanting it. Prosecutor: I understand you, yes. Cannon: And we don’t consider it inevitable. A variation of historical processes is possible. But we say the overwhelming weight of possibility, based upon historical experience, is that the ruling class of this country will attempt to resolve the conflict with the workers by fascist violence before we gain a majority in Congress. Or if it should come to the point where we gain a majority in a democratic election, the ruling class would stage a slaveholders’ rebellion against it. And we will undertake to put down that rebellion as decisively as possible. Some leftists have questioned why Socialist Alliance ever contemplated unity with Socialist Alternative, given the latter’s politics and record. But exploring the possibility of unity between our two organisations was a worthy and necessary project. The potential gains of successfully uniting the two largest socialist organisations in the country were self-evident. In accepting (in 2012) that differences of historical interpretation or differences of theory should not be obstacles to unity, Socialist Alternative took an important step forward. That had been the view of Socialist Alliance since its inception. As an avowed unity project itself, Socialist Alliance had to respond to this development and so we approached Socialist Alternative for talks. The high point of the process was Socialist Alternative’s Marxism 2013 conference, where an enthusiasm for unity was very noticeable, even if not everyone was convinced. But Socialist Alliance was also quite clear that there was a considerable political gap to bridge in terms of how each organisation saw socialist political activity today. In the end, the Socialist Alternative leadership opted for sticking with its very narrow, propagandist view of socialist politics and pulled away from the whole process. This particular attempt at left unity has come to an end, but the idea will keep presenting itself. There is simply no way around it. We don’t know who will eventually come on board but we have to keep searching for ways to bring the maximum progressive forces together to build an effective political vehicle that can lead a real challenge to this terminally sick system. 1. For the correspondence between the two organisations see http://alliancevoices.blogspot.com.au/2013/11/dossier-on-unity-talks-between.html. 3. See http://www.marxists.org/archive/marx/works/1867-c1/p6.htm (emphasis added). 4. See http://www.marxists.org/archive/cannon/works/1941/socialism/ch01.htm (emphasis added).